At the bitter end of every trip I make back to Louisiana, I always head to LaPlace for a smoked meat care package to take back north. My stop on the last trip (two years ago, I know, bad blogger) was to Wayne Jacob’s Smokehouse, not to be confused with Jacob’s Andouille which is also in LaPlace. (See my post on Jacob’s Andouille here). Upon arriving at Wayne Jacob’s I was pleased to find out that they also run a restaurant with many of the items on the menu made with the smoked products that they produce! Unlike Jacob’s Adouille, Wayne Jacob’s does not ship their products because that would mean that they would have to change the way that they produce their meats, that is, the way it has been produced there since 1950. Admirable. The restaurant was very busy for the lunch rush when I arrived and a little short staffed to boot, but everyone was super friendly. I ordered a few appetizers to check out some of the fine Charcuterie work that David Rauch does in the back of the house, and I was super pleased that I got to go into the back and say hello to David and get a few photos of him at work! I also got a few shots of the cracklins that were cooling on the back counter before being bagged up! The Hog Cracklin, a thing of southern beauty! Notice the course grind and the large size of the casing, expertly filled with no air gaps, and lastly perfectly smoked, not overpowering…just perfect. 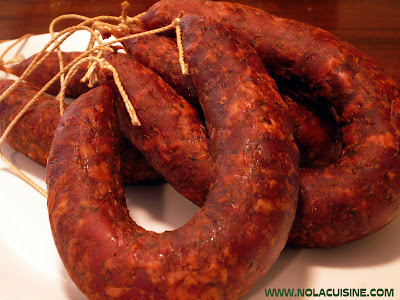 I enjoy the Andouille that I produce (my Andouille Recipe) and I also enjoy the one at Jacob’s Andouille. 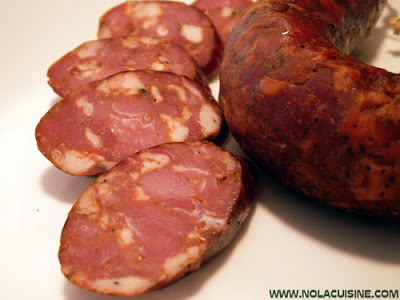 But in my humble opinion, as Andouille goes, the product that David Rauch produces in LaPlace is by far the benchmark. Well it’s Fall again, and in my house that means it’s time to fire up the smoker and start bulking up the freezer with Andouille, Tasso, and other seasoning meats for Gumbo, soup and stew season. I love the smell of the crisp fall air, mixed with the smell of rich pecan smoke. It reminds me of campfires from my childhood, and unless you have fallen into one, I’m sure those are good memories for you as well. I finished a fresh batch of Andouille on Sunday, and I’m thrilled with the results, so thrilled in fact that I had to whip up a batch of Chicken & Andouille Gumbo for dinner last night. Here is a pic of last night’s Gumbo. * Instead of grinding the meat, I hand cut all of the meat into 1/4″ – 1/2″ cubes. I think this produces a much better texture. * I poked the sausages all over with a toothpick. This allows for easy smoke absorption, and you can also get rid of any air pockets that are there from the stuffing process. * I completely let the casings dry out before smoking. I cannot stress how important this step is. I wiped the casings dry with paper towel, then let the sausages hang in the refrigerator overnight. You will know that the sausages are ready for the smoker when you can see the meat clearly through the casing. 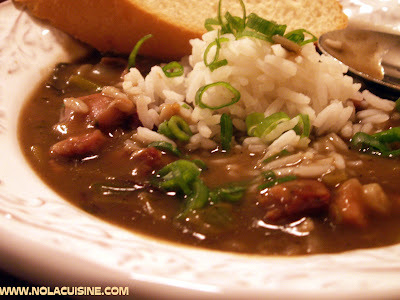 Be sure and check out my ever growing Index of Creole & Cajun Recipes! Yesterday was bitter cold here in the Detroit area, perfect Gumbo weather, so I whipped up a small batch to warm our souls. When it comes to chicken for soups, I’m a leg & thigh man. For my money you can’t beat that moist, flavorful dark meat just melting away in the pot. I don’t like my Gumbos too thick or too thin, but just in the middle, like velvet on your tongue. Bake the chicken thighs in a 350-400 degree oven until brown. Mix your onion, celery, and bell pepper together: The Holy Trinity. Heat the oil in a cast iron dutch oven over medium heat. Whisk in the flour to make a milk chocolate Roux (making a Roux). Add the Andouille, 1 Tbsp of Seasoning, and 3/4 of the Holy Trinity, cook, stirring often, for about ten minutes or until the vegetables soften. Add the cold stock, the remaining 1/4 trinity, remaining seasoning, and Garlic. Bring to a Boil. Bring this down to a simmer, add the baked thighs and let it go for at least 2 hours, stirring occasionally. About 10-15 minutes before you’re ready to serve, remove the Chicken from the bone and add the meat back to the pot. Add the Worcestershire, Hot Sauce, and 1/2 of the Green Onions. Serve with Creole Boiled Rice, crusty French Bread, and a good cold beer (I like Dixie or Abita Amber). Garnish with green onions, and the parsley. * I prefer Chicken Thighs for my soups and Gumbos. It’s the misunderstood portion of the bird, which is fine by me because it keeps the price down. I get them bone in, then Cartel wrap the bones and stick them in the freezer for stock. I’m like a Vulture when it comes to bones for stocks, my freezer looks like the Catacombs (animals only of course). Check out my Creole & Cajun Recipe Page, an index of all of the recipes (so far) on this site! Celebrating the Food and Drink of New Orleans Louisiana!